Since a lot of TNT loyalist are looking for affordable TNT/SMART internet offers, we come up to share this new promos by Talk N Text. It includes unlimited internet codes, fixed MB surf data, Facebook mobile at fixed rates and unli rates, and social media promos. We also provide some photos, so that you can share or email to your TNT friends conveniently. Worried for Talk N Text internet settings? No worries, we'll share how to activate your GPRS/3G. To activate your GPRS/3G settings text SET to 211, wait for confirmation message and key-in 1234 for the password. 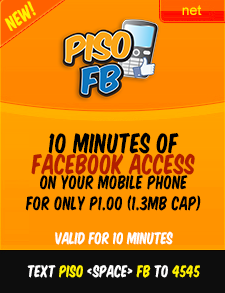 Piso FB or 1 peso Facebook Promo - PisoFb will give you 10 minutes of Facebook access, mind you that PisoFB is cap at 1.3MB of data. Can only be used on mobile phones, to register text PISO (space) FB send to 4545. 1.3MB is enough for 10mins. of Facebook, watching videos is not recommended, as this will consume data fast. 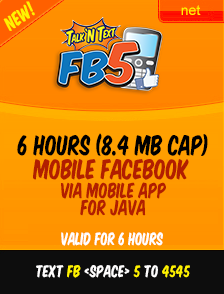 FB5 TNT - P5.00 for 6 hours of Facebook connection, cap at 8.4 MB of data, to avail the promo just send FB (space) 5 to 4545. Just remember, this promo is for mobile only, and never use this promo to watch FB videos, you'll finish all 8.4MB before you know it. 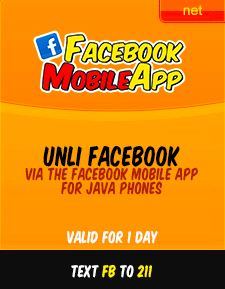 Unli Facebook Promo - Connect to friends and families for 1 day using this promo, there are no caps, so use it as you may, as long as you stay on Facebook domain your free from additional charge. To avail the promo send FB to 211 for P10 only. TNT Always ON - For only P20, you can surf webpage, download anything, watch videos, and all internet activity. 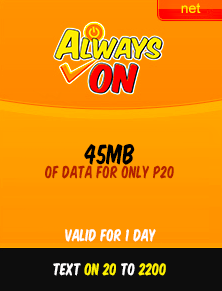 Just remember Always-ON is cap at 45MB of data that is good for 1 day. To register, text ON (space) 20 and send to 2200. Talk N Text Standard Browsing Rates - Using your mobile phones, you can surf, watch, and socialize using TNT internet services. For 30 minutes you can enjoy anything you want on the WWW, all this for only P10 which of course valid for 30mins. Note: You can use any browser you like. 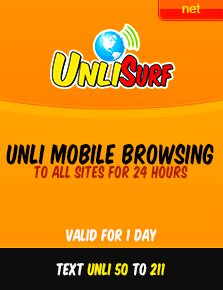 Unli Surf Promo - Enjoy unlimited mobile internet for 1 day using this promo code, registration is simple, just type UNLI (space) 50 and send to 211, and boom! You now have 24 hours of internet which covers any sites on the web, how much? P50.00 only! Note: Limited to 1gb data allocation, after consuming internet speed will be throttled. Talk N Text Unli Yahoo! - Browse your Yahoo! emails and even use you Yahoo! messenger via mobile browser (no app needed). For only P15/day, to register text YAHOO UNLI and send to 211, also available for SMART subscribers. 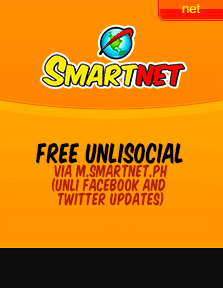 SMART Net Free Unli Social - Avail free unlimited social on Facebook and Twitter, just visit m.smartnet.ph for more info. Well, that's we have for now. Just be sure to subscriber to get daily updates of Talk N Text promos and deals. Don't forget to like and share to your TNT Ka-Tropa. Yang SURFMAX ba gumagana ? Ayaw na ksi ng unlisurf eh. Yan po b ung good for 3days? May good for 5 days po ba na unlisurf?? ang 150 load ba ay may free inernet ?? yung U150 - 4545 na unli .